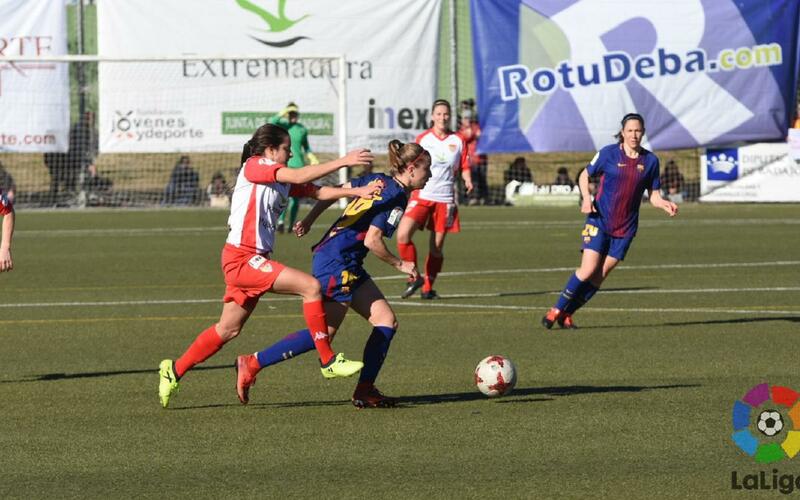 The Barça women dominated from start to finish on Saturday afternoon against Santa Teresa, and two goals from Bárbara Latorre and another from Alexia Putellas ensured a convincing win in the Liga Femenina Iberdrola. It took half an hour to break the deadlock, a fine team effort started by Putellas with a terrific through ball to Melani Serrano, with Latorre finishing things off. The home side, from Badajoz in Extremadura, never caused any real trouble until after the break, but the well-organised Barça defence made sure the danger was kept to the bare minimum. Barça weren’t creating many chances of their own either, but extended their league with a stunning set piece that caught the opposition totally by surprise, with Putellas putting the ball in the net. It was full steam, ahead from then on, and a splendid strike from Latorre off a Lieke Martens assist put the game to bed. Thanks to the win, Barça now top the league, but Atlético Madrid have yet to play – their trip to Athletic Clu Bilbao is on Sunday.